Things are progressing quickly now. Since the last update on my N Gauge Cornish Tin mine a lot has happened. Here’s the full report with tips and experiences learnt along the way. I’ve mentioned a few times that I was still working out the plan for the industrial area of my layout (I must find a name for it). And after a lot of research on Cornish mining and the area in question, I’ve finally arrived at a track and terrain plan I’m happy with. You can see this below. Given this is N Gauge on 2 x 3 foot board, it looks like there’s a lot going on but this is all compressed but realistic for the the area at the time – 19th Century mid-Cornwall. My N Gauge Cornish Tin mine themed layout and track plan. All the key details are now in place. The core layout hasn’t changed that much from my track plan design in early April. The latest version now has a loop added to the main oval allowing the locos to swap ends of wagon trains. Turnouts and spurs for the industry zone also run off this. The opposite end of the spur also allows the engine shed to migrate from front right spur to rear left. Doing this gives more space for the shed itself and refuelling facilities. In the real St Blazey track plan, on which this layout is imaginatively based, a large sidings, round house and turntable are located at the rear. I don’t currently have space for this on my baseboard but if it was extended, the engine shed spur could make and become a connection to this area. If you look carefully there’s also an unused turnout towards the front. This is there to ease further possible future expansion and would allow for a track connecting to a dock/harbour on a new baseboard to the left or front section. I’ve also firmed up mine locations. There will be two mines – Wheal Fortune and Wheal Chance, the names taken from real mines in the Fowey Consoles group, which are very close to Par and St Blazey. In my layout, Wheal Chance will be abandoned after tin deposits dried up while Wheal Fortune continues to operate, producing considerable tin ore.
Luckily, I’ve found a very realistic plaster built Cornish mine model on eBay (from engage_kernow). These appear accurate recreations of the famous dilapidated mine buildings that can be found across Cornwall and once painted and and situated on the hills should add real atmosphere to my layout. The picture here is the painted image from eBay, I’ll post my attempt once it’s complete. One important tip, is to ensure you have lots of reference photographs to work from. If I didn’t have a lot of pictures and wonderful photographs (from the Internet) of these structures I would never have guess they had Red top chimneys and would be lost as to how to paint the stone work. More on this another time. 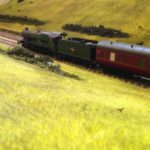 The plan is to use another of these models for Wheal Fortune – situated on a nearby hill – but upgraded and extended as it’s a working mine. A roof will need adding, as will the wooden platform at the top of the structure and maybe wheel along with associated buildings around it. For cheap but wonderfully realistic wooden planks use wooden stirring sticks of the kind you find in coffee shops. I’ll be using these for the wooden platform on the mine building but they can also be used for railway crossings and other wooden structures. Just cut the stirring sticks to the required size, stain with a brown finish to get a natural colour and hey presto mini wooden planks. They look incredibly authentic and even have a natural wood grain! Cornish mines continually filled with water and to drain them while also lifting men, rocks and ore to the surface a steam engine was used. This was housed in the buildings you see next to the Chimney. For this engine and other processing work a water supply is naturally needed so they were typically built near with a water source. In the case of Wheal Fortune a reservoir can be found further up the hill. A water way – known as a Leat – from the here to the mine has been cut into the side of the hill letting gravity bring the water to the mine as needed. This is all shown in the above plan, with poor crumbling Wheal Chance on the hill towards the middle and left, with Wheal Fortune and it’s water reservoir located on the hill towards further back and towards to the inner sidings. On the subject of water, on a recent visit to the area to research terrain and engine sheds at St Blazey I noticed how many ponds, streams and rivers there are in the area. If you compare the plan above with previous versions you’ll see that this is reflected in the layout with more ponds and in the landscape itself there will be even more. There’s also a nice old bridge (dating back to 13th Century) which I want to incorporate somewhere but haven’t decided where yet – possibly around the village area once this is being built. Langley Models Coal Cart, carrying coal up the hill to the Wheal Fortune. Around the buildings of Wheel Fortune will be all the paraphernalia of 19th Century Cornish mining activity. Workers can be seen coming and going from their back breaking work deep underground, mine carts transporting the ore, coal being carried up to the mine steam engine on horse drawn wagons, and barrels, sacks and wood laying around. I struggled to find 19th Century mining figures but as luck would have it I stumbled across a pack of unpainted figures from Model Scene (pack 5156). These look just perfect for my mine workers but could be home in any industrial/farming setting. The wood will come from the trees on the hills to the right, with tree felling and the previously mentioned wood yard visible amongst the trees. 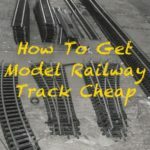 As mentioned in the story behind my model railway, this will either be scratch built (using the stirring sticks described above) or using Faller’s plastic model. I’m using Langley Models figures for the the horse drawn cart and wood cutters and will update you when these arrive. The output from the mines will be taken to the industrial area. 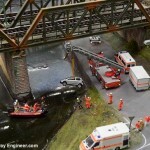 You can see the result of this thinking in the track plan above. The front left spur that’s been added will be home to wagon loading area, smelting works and a small crane. I thinking of having another loading area near the mines so ore can be taken from the mine to the smelting works but may not have the space for this. We’ll see. The spur mentioned also runs in the opposite direction, to the rear of the layout, where the engine shed and coal and water refuelling point are now located. A nearby pond provides supply to a water tower (Ratio Models 215) for locos and a enterprising trader has set up a track side coal yard – which I’ve built and painted previously (coal yard painting). With the plan complete I’ve continued work on the laying the track. I’ve also started on ballasting but haven’t completed this yet as I still need to fit the point motors. These will be Peco PL10E’s that sit under the baseboard, through which a has slit drilled, to operate the turnouts. 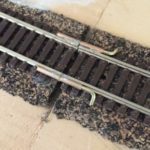 Fixing the track down and ballasting before this would be a mistake and I don’t fancy removing glued on ballast again (an old story). 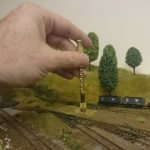 Although this is easy enough to do – here’s a five step technique for deballasting – it’s not something I have time for at the moment. In parallel to the work on the track and ballasting, I’ve also got a lot of the hill foundations now in place. I’m using Polystyrene tiles for the basic hill shapes and tunnel and then finishing it off using Polyfilla. An experience point to note is to cover up points/turnouts when working with Polystyrene. Tiny bits seem to come lose all the time and play havoc with the moving bits of points. I bit of masking tape over the top of the points would have save a lot of cleaning effort. I working on a post on hills and rock faces so don’t want to say too much more on this yet. Finally, I’ve also been working on the under board electrics, securing the track power and point/light buses in place and running feeders. A test run of a Jinty engine around the track confirmed it’s all working so far – phew! The next steps will be to get the point motors and uncouplers in place, finish track and hopefully ballasting and get the hills and tunnel complete. I also want to have a go at the mine shaft and facing mirror optics trick to see how realistic it looks.